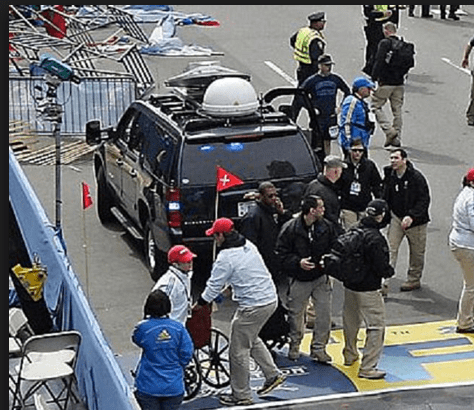 The Boston Bombing: What Happened? Day one of the Boston bombing. What happened? 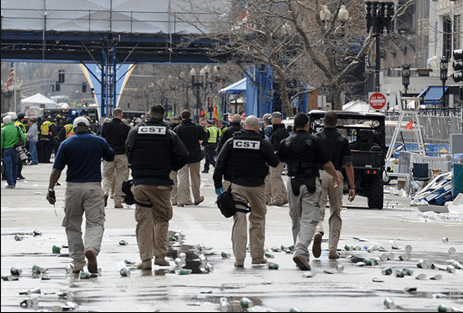 On April 15, 2013 at approximately 2:50pm a homemade bomb detonated near the finish line of the Boston Marathon. 10-15 seconds later a second bomb exploded. 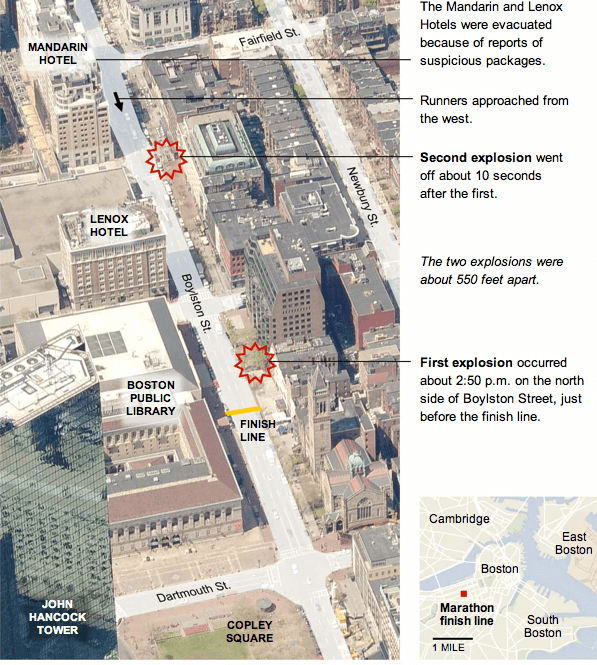 Via NY Times, here is a map of the Boston marathon and where the bombings took place. Early tweets from the Boston Police Dept. showed 2 dead and 23 injuries. But when it would all be said and done there would be 3 deaths, including an 8 year old boy, and hundreds of injuries. Many people lost their limbs. It was a horrific scene as we all saw on the news that day. Innocent lives were lost and scores of people had their lives changed forever because of the bombing. There were a multitude of tweets about other explosions, controlled detonations and unexploded devices. There were tweets about undetonated bombs found in the grandstand. There were reports of an undetonated bomb at the Harvard station. The Boston Globe reported multiple reports of unexploded devices around Boston. They also reported, per an intelligence officer, that two more explosives were found and were being dismantled. One report was of “an unexploded device on the glass footbridge over Huntington Ave. near Copley place.” Time reporter Andrew Katz reported that another device was discovered in front of the Mandarin Hotel, information that reportedly came from the police scanner. And let’s not forget about the JFK library. Initial reports said that there was an explosion at the JFK library. 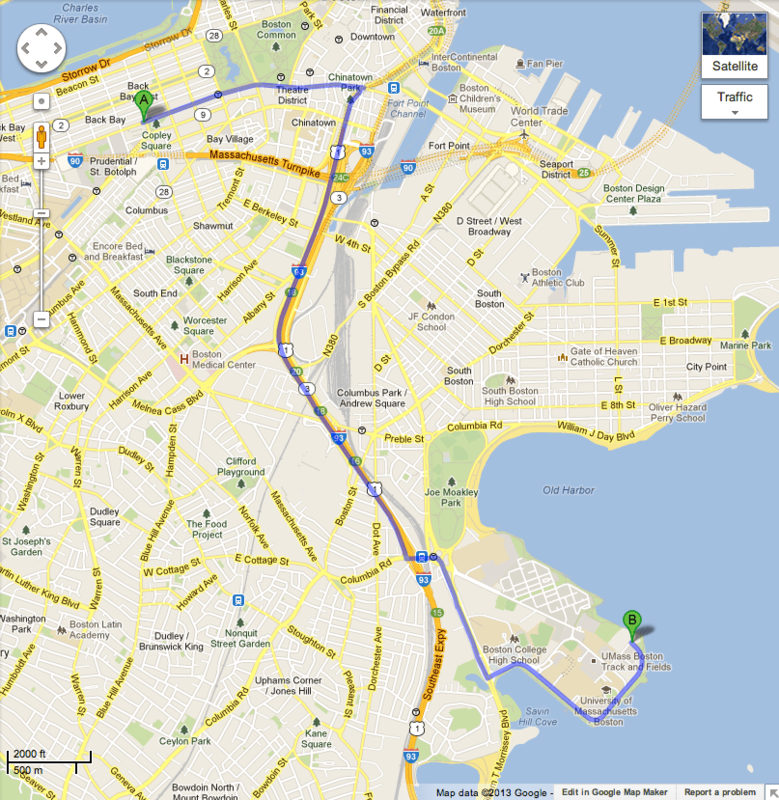 Point B on the Google map below shows where JFK library is located. Point A on the map is where the Boston Public Library is located. As you can see, the JFK library is no where near the boston Marathon, but the Boston Public Library clearly is located near the marathon . For whatever reasons, I believed initially that the JFK library was right there by the marathon. But it’s not. But apparently there was a fire located at JFK. The question, on April 15, was whether it was related to the marathon bombings and did the fire start because of an explosion? Media reports, including a Boston police news conference on April 15, seen here (see the 3:00 mark) , reported that there was indeed an explosion at the JFK library. Later media reports stated that the blast may have been related to a 3pm fire that had started inside the library. I believe the picture to the right is of the JFK library after the explosion/fire. 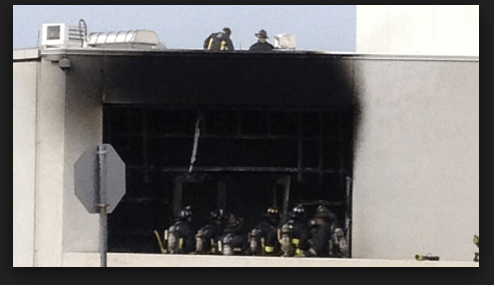 On April 19, the Boston Globe reported that the fire at the library was caused by “careless disposal of smoking materials.” They cited city fire officials. But other news sites such a Yahoo News reported later on that “A reported fire at Boston’s John F. Kennedy Presidential Library turned out to be the result of an electrical problem.” In the end, officials that originally reported an explosion and were afraid that it may have been linked to the bombings at the marathon, later reported that the fire was an unrelated event. As a side note, later media reports make no mentions of any explosion at the library. And remember who told us about this explosion – Boston Police Commissioner Edward Davis. Miscommunication? Uh. Yeah. I’d say so if it really was just a fire. After the boston explosions, the internet had it’s own explosion. An explosion of the internet sleuth kind. Internet sleuths and some websites were hellbent on finding the bombers somewhere in all the available media pictures and video. It was the ultimate online game of Where’s Waldo. Various people were singled out, their pictures plastered all over the internet and guess what? Yup. They weren’t the bombers. But some interesting things did come up such as these guys seen to the left. The question heard around the “conspiracy world” was, “Who are these guys?” Some believe that these guys are behind the bombings. Some websites said that these guys may be “Craft.” Honestly, I’m not sure what they’re talking about. There is a military training website out there called CRAFT International at thecraft.com. Is this what everyone is talking about? I didn’t go through the entire website but from what I saw it appears they are about training, sniper activity, combat training and surveillance. Craft International is said to be a private military/security firm similar to Blackwater. 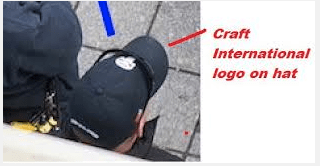 On their website, it appears that the logo for Craft is this little skull picture to the left, which says “Craft.” Now the big beef with some people out there is that there were men seen in these khaki pants, black jackets, black backpacks AND baseball hats with this skull emblem on them (as seen in picture to the left). Two things, 1. 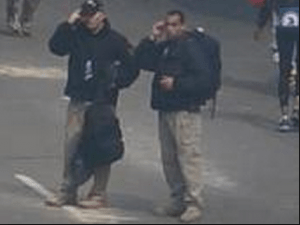 If indeed this man with the baseball hat on is from Craft International, what exactly does that mean for the Boston bombing? And 2. I’d really like the source for this online circulating picture with the baseball hat. No, seriously. Anyone? It would be appreciated. Okay, last but not least, there is one more picture I should post that may or may not clear things up. See picture to the left. Group of guys, khaki pants, same boots, black jackets, etc. etc. and on the back of their jackets? CST. CST probably stands for National Guard Civil Support Teams but really, don’t quote me on that. If you want to read more about these teams go ➤ infowars.com. If infowars isn’t your cup of tea for your daily news try nti.org ➤ Here. NTI’s article discusses the 20-person team out of New York, how Defense Secretary Chuck Hagel gave the team the boot on March 29 (they were to lose their funding and be dismantled by early June) and how that decision was reversed after the bombings. Okay, moving on, let’s take a look at one theory on the boston bombing that really wasn’t a theory at all. Ready? See this guy on the top of the building? In the picture to the right? Uh huh. Him. He’s a terrorist. Why? 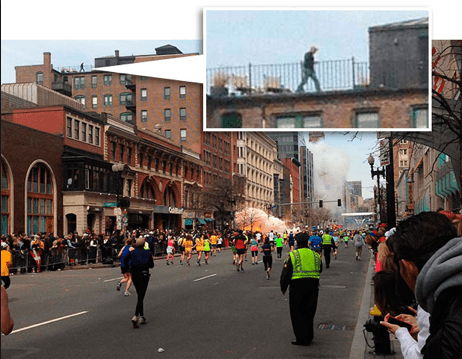 Because he’s on top of the building near the Boston Marathon finish line and near the explosion. That’s it. That’s all I got. And that’s all anyone really had as an explanation after this picture was posted online. I mean, yeah. He could be a terrorist in on the Boston plot, but come on. Someone’s got to give me a little more than this. How about some of the other speculations that took place after the bombings? 2. A Saudi national was in custody at the hospital. A few of the following pictures that I found make me wonder if one of these or any of them are the Saudi national. And frankly, I am not even sure if this third picture is from the Boston Marathon bombings. I cannot find the source. Is this person being detained or are they injured? Surely if this person survived the blast their sunglasses would not still be on? 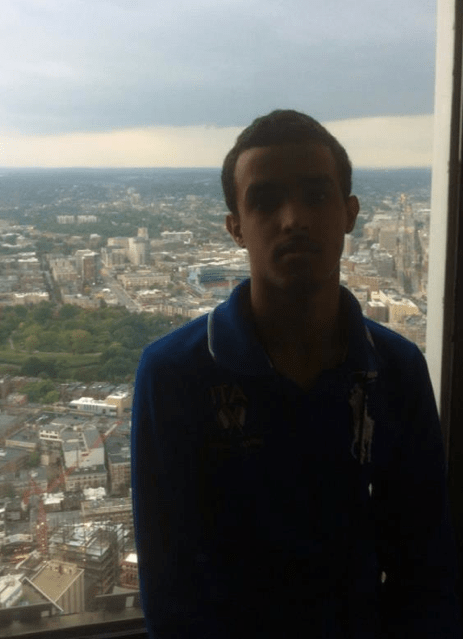 The Saudi national was eventually identified as Abdulrahman Ali Alharbi. 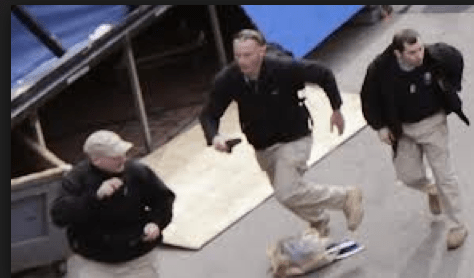 Some theories out there is that this man was considered a suspect and taken into custody, put on the terrorist watch list, taken off the watch list and possibly deported. Depending on which website you click on depends on which story you’ll get, if any. Glenn Beck’s producer of The Blaze has actually taken this to Congress…or has she? The following is an email sent from Virginia Grace, producer of The Blaze, to…well…the email I found online is addressed to the same Virginia Grace. 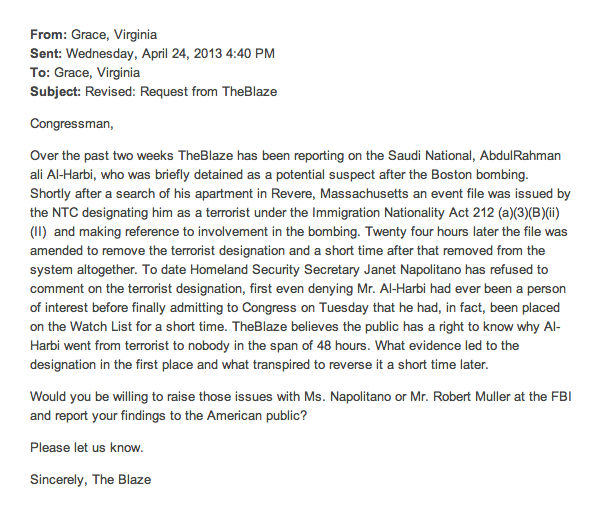 So…did this email really get sent to Congress? No idea. 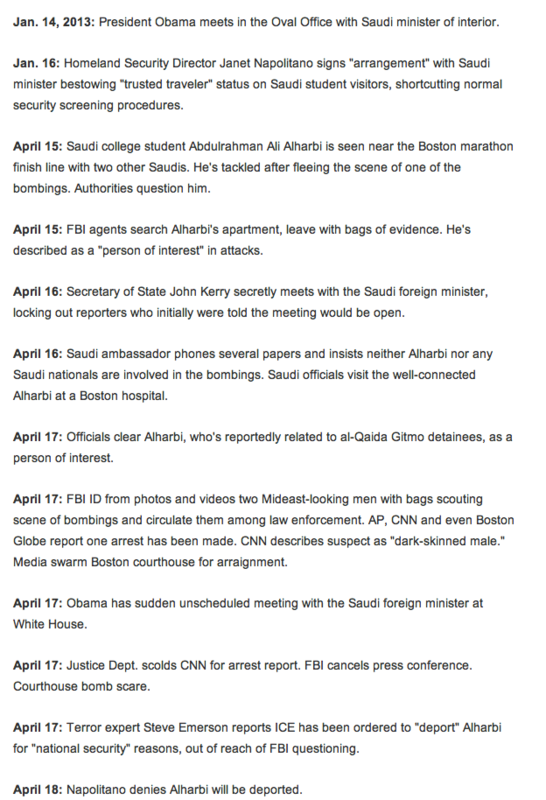 Oh yeah, did I forget to mention this Saudi was “acting suspiciously” after the bombing (you know, like he wasn’t completely blown up, he was just injured – suspicious!) and civilians grabbed him? No? Well, apparently that all went down, too. The NY Post wrote, “Investigators early last night converged on a fifth-floor apartment where the person of interest lives with two roommates.” In the same article a law student, Marcus Worthington, 24, (a neighbor in the same building) was quoted as saying he had spoken with an ATF official and said they were investigating a tip about a dangerous device in one of the apartments. And MyFoxBoston’s take on these shenanigans? Hold please. “A law enforcement source tells Fox 25 that a large police presence at a home in Revere is related to the Boston Marathon bombings. The source said that a suspicious driver was pulled over by Revere police after driving past the State Police barracks a number of times. Law enforcement seen with large garbage bag leaving building. Large garbage bag taken by officials at 364 Ocean Drive. So this guy is at the hospital, his apartment is searched, his belongings are taken, his roommates are interrogated for 5 hours based on a “tip” and he’s NOT a suspect? Or was it that he wasn’t a suspect after law enforcement and other government agencies dragged them over the coals and ransacked their apartment? There are a few other interesting tidbits that came out that may or may not be true or have any meaning. First of all is this picture you see to the left. Now officials have come out to say that there was another Saudi possibly being deported because of Visa issues (maybe??). They reported that this second Saudi was in no relation to the first Saudi who was in the hospital after the explosions. So I have no idea if this image is referring to the Boston Marathon Saudi or the other one with Visa issues. And I have no idea where this image came from and if it’s some sort of real document. I have no source for this. But if it is legit, then my questions are 1. Why the initial after Ali? Abdulrahman’s name doesn’t appear to have an E. in it anywhere. 2. When is Abdulrahman’s birthday? 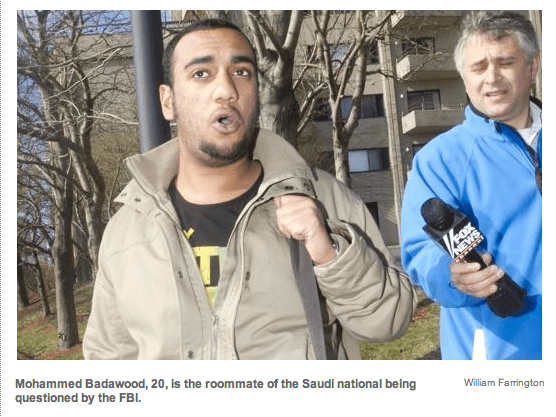 Are there really two 20 year old Saudis running around Boston in trouble with the government at the exact same time, with almost the exact same name? 3. Was Abdulrahman ever a student in Findlay, Ohio before coming to Boston, MA? Now if we go back to the blog post that Abdul’s teacher wrote, it does say that she wrote him a recommendation for college. And I believe she works at The New England School of English located in Boston. But I am not clear as to when Abdul attended there and whether or not it would prove he attended the University of Findlay in Ohio. Second tidbit of information that may or may not be of any relevance – has our government been meeting with Saudi officials regarding a terrorist cell that Abdulrahman may be associated with? Folks, seriously. I’m exhausted from keeping this all straight. I’m simply going to post a timeline that news.investors.com posted online. You can take it from there. Investigate and draw your own conclusions. 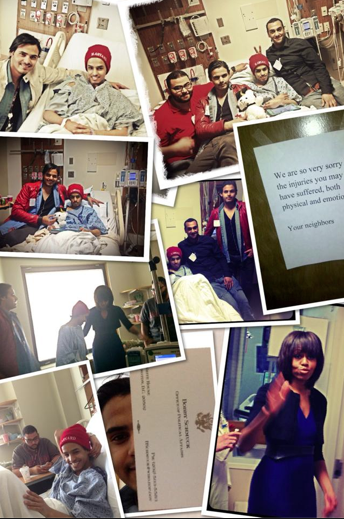 And let’s not forget that Abdulrahman was visited by Michelle Obama in the hospital. Could it mean something? Absolutely. Does it prove anything? Absolutely not. 3. Glass from storefronts blown out, not in. If the blast was to the left of this picture, how is the glass from the store blown outside, not inside? 4. The final marker at the race was dedicated to the Newtown victims. Folks, even the suspected killer took time out of his “on the run” activities to tweet this story was fake. Even.the.bomber. The story is not true and this woman did not pass away. 6. 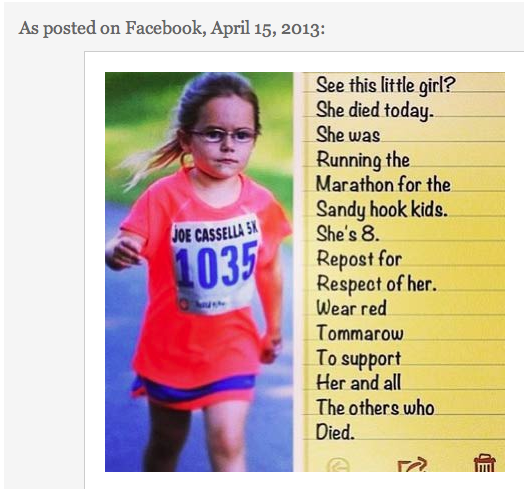 8 year old little girl killed at the Boston Marathon. Ya’ll remember seeing these tweets to the left? Yup, a little girl died at the marathon. No, actually that never happened. But some of the sheep still re-tweeted it. And how about this picture to the left? Remember that tweet? Yup, some sick individual decided they’d start posting this ridiculousness. This little girl was never at the marathon and never died in the explosions. Who comes up with this stuff? And the people that retweet this stuff are the same people that have a problem with Alistair Stevenson being questioned. Omg. Well, if that isn’t enough for you, there were others that not only tweeted that an 8 year old lost their life in the explosion, but a 3 year old did, as well. I’m sure there’s stuff I’ve missed from that first day. Sorry! Boston bombing recap to be continued. Liked it? Take a second to support Jimmysllama on Patreon! I’ve been researching this extensively almost from day one.I have reviewed hundreds of photographs both professional and amateur, I have reviewed hours of video footage, again both professional and amateur.I have come to the conclusion this event was a hoax, staged to appear as the official narrative says – terrorist bomb attack.My comment is specific to “Man was going to propose to girlfriend.”The man in this story was inside marathon sports at the time of the first ‘explosion’ and as he rushed outside he passed by at least three injured people.One was Leeann Yanni, as she stumbled into the store and fell to the floor, the second was Michelle L’Heureux, she limped in holding her knee and was one of the few to suffer upper body injuries, the third was outside the store.Sara Valverde was bleeding profusely just outside the store alongside the fence of the patio.Amazingly, he saw Sydney on the ground just past the corner post of the patio.This is the spot where Sydney first went down after the ‘blast’.He went directly to Sydney, helped her to her feet and walked her to the spot where the famous photograph was taken by John Tlumacki.He and a woman(in a long brown sweater and scarf – https://jimmysllama.com/wp-content/uploads/2015/06/exh_6_0.pdf) together applied pressure to Sydney’s injured leg.At some point two firemen attended to Sydney as well, eventually they gave way to Matt Smith and Zack Mione.Where did the guy in the red tee go?Believe it or not, he went to Rebekah Gregory.She was laying on the ground with a massive injury to her left foot/ankle amid other wounded and dozens of medical/paramedics/firemen and police.He runs up to her, tears at her jeans to expose her wounds, he then holds he leg up, resting her foot on his thigh as Colton Kilgore films and photographs her injury.His hasn’t any gloves on and his hands are stained with blood from attending to Sydney’s wound.Afterward, he drops Rebekah’s leg and tries to go back to Sydney but she is now being attended to by Matt and Zack.Where he went to next is a mystery as no video or photographs exist showing him leave but I would suspect he went from where he came, back into marathon sports.I figured he worked at the store but have never seen a report/interview of him and nobody from marathon sports have mentioned him.On Sydney & Celeste’s GoFundMe page they stated they thanked everyone who helped save Sydney and that a person wished to remain anonymous so they never mention his name.I’ve always thought it strange to see the family give thanks to the people who helped Sydney, but never mention the one person who was the very first to help and was most likely the one responsible for truly saving her, considering the injury she suffered was by all accounts a mortal wound.I have finally found out the name of this person – Joe Duncan, he’s was/is a Marine! I’m still trying to find out what I can about Mr Duncan.